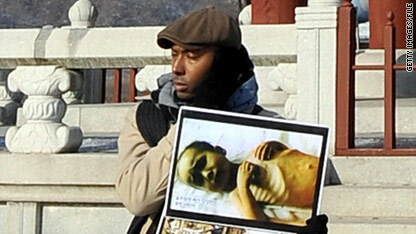 Gomes, seen here attending a rally in South Korea in January, was pardoned by North Korea, the Carter Center says. Former U.S. President Jimmy Carter is leaving North Korea with a U.S. citizen who was imprisoned in the communist country after entering it illegally in January, according to the Carter Center in Atlanta, Georgia. Aijalon Mahli Gomes, 31, of Boston, Massachusetts, was imprisoned in January and later sentenced to eight years of hard labor with a fine of about $600,000 for the crime of illegal entry into North Korea. "At the request of President Carter, and for humanitarian purposes, Mr. Gomes was granted amnesty by the chairman of the National Defense Commission, Kim Jong-Il," the Carter Center said in a statement. Carter arrived in North Korea on Wednesday to negotiate Gomes' release. Carter traveled in his capacity as a private citizen, senior administration officials told CNN earlier. They added Carter had contacted the administration of President Barack Obama about the mission. Two American journalists - Laura Ling and Euna Lee, who had crossed the border into North Korea in March 2009 and were arrested and sentenced to 12 years hard labor - were released in August after an intervention by former U.S. President Bill Clinton. You don't know how these things work. We can't send anyone from the government because we don't have diplomatic relations. So, we have to send a private citizen. The highest ranking private citizens we have are former presidents. To send someone less would not produce the results and would be seen by them as a slap in the face. But, since we sent a former president, they can't refuse to release the detained person, or they will dishonor him. Everything has to do with honor and what is correct. As soon as I heard Carter was going, I knew the guy was going home. Well to all you Reagan lovers out there. He was a mediocre president but also the luckiest president in the history of our nation. If it wasn't for the inevitable collapse of the Berlin wall he would have been more famous for his Hollywood career and to have ruined the American middle class. In addition selling arms to Iran. Seriously, I hate Obama as much as the next guy but, to blame him for not getting this idiot back thats going too far. For all anyone knows this guy was still 10 feet from the border when the N.K.s nabbed him. And sending in a current diplomat would only cause further issues between the U.S. and Kim Jong Il, who btw hates everything American. I served my Country gratefully to protet its citizens, the intelligent and the uneducated the rich and the poor the democrats and the republicans... you dont like the president vote for a new one! Carter is just such an outrageous joke. Gomes would have been released if Jon Stewart had gone to NK. All NK wanted was an American celebrity, "any" American celebrity, to "beg for mercy". Please! If Carter's ego was any larger it would push us out of orbit. What an @ss. All these comments, save for the enlightened few, are quite fascinating in their display of politico-religious polarization and ignorance-fueled hatred. Is that the human race? Oh and by the way, "Nobel", as in Nobel Prize, is the name of Alfred Nobel who invented dynamite, and in whose memory the prizes in science, literature and peace were established; while "Noble" is an adjective that refers to the higher ideals for an elevated character. That both terms would apply to Mr Carter and his accomplishments is no excuse to misspell one into the other regardless of context. I meant "higher ideals of an elevated character"
Okay people! Who cares about the political parties! Damn! Thats whats wrong with this country in the first place!!!! What I think we demand our good old government is...Give the Democratic Party's and the Republican Party's hand held machine guns! And at the end of it see which politicians are standing! I'm myself am tired of the this political warfare! I think we should combined the two parties and then it wont be democrat this and republican that! Oh! And for all the tree hippie liberals...your doing more damage to our country than you are doing good! So take a vacation and try some bungee jumping...with no cord! Lebanese President Michel Sleiman has officially asked Iran to equip and modernize the Lebanese Army, given the problems Beirut is facing. Sleiman has asked Iranian officials to consider selling advanced military equipment to the Lebanese Army, reported IRNA. The Lebanese president has reiterated that the modernization should take place while keeping in mind Beirut's strategic needs as well as its budget limitations. This follows recent deadly confrontation between Lebanese and Israeli forces. The exchange of fire left three Lebanese soldiers and one Israeli military officer dead. After the incident, US officials announced that they would freeze 100 million dollars in military aid destined for Beirut. Former U.S. President Jimmy Carter and that U.S. teacher Aijalon Mahli Gomes now have North Korean Customs visitor stamps in their U.S. Passports. That's sort of unique. How can I receive a D.P.R.K. Customs stamp in my U.S. Passport? I thought it was illegal for U.S. Citizens to visit North Korea? Lets see, list of rare customs stamps to get in my U.S. Passport; Cuba and The Democratic Peoples Republic of Korea (North Korea). It would probably never happen because I do not intend to ever visit those aforementioned countries in my life but, it would be interesting. If I did, I would probably have U.S. Immigrations and Customs Enforcement, U.S. Central Intelligence Agency and U.S. Military Intelligence debriefing me when I returned into the U.S.
Best you could edit the blog name Carter returning from North Korea with detained American – This Just In – CNN.com Blogs to something more generic for your blog post you make. I liked the the writing however.